My husband and I each have our own jars that we deposit our loose change into. I keep my loose change in my car until the little coin compartment can’t fit anymore and then dump most of it into my jar at home. My husband is more systematic, and empties his pockets each day to feed his jar. He’ll sometimes take out a few coins in the morning for the vending machine, but most of it stays in his little coin collection. Over the weekend, I noticed that his jar was full. Thus, I decided it would be a good time to see how much he had collected. I have to admit, I was impressed. His little container weighed in at 11.4 lbs, and was mostly filled with dimes and quarters. He clearly had enough to warrant a trip to the bank. After sorting and counting everything, we found that he had saved a total of $112 – much more than the $50 in my coin jar. Looking at the nice chunk of change that he had set aside, I thought it would be an interesting exercise to come up with a list of options for putting his spare change to use. Since he only touches the very top portion of the jar to grab some loose change for the day, one option that would be to deposit the excess into a high yield savings account. The primary advantage in this case would be that he’d earn a bit of interest on what he’s already saved. 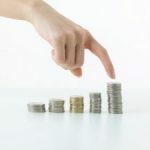 General savings: Besides bulking up our emergency fund, we’re also including some savings in anticipation of a decrease of work-related income when the baby comes. I’m self-employed, and I’ll be taking it easy for a bit as I make the transition. I don’t know how long it will take, but thinking about the worst case, I’m looking at 3 months of decreased income. Baby expenses: Doctor visits and delivering at a hospital can get pretty expensive, so we’re setting aside some money to cover the expected expenses. Car replacement fund: Our cars are both 10+ years old. While they’re still going strong, we’re planning ahead and saving for the next car. Vacation fund: We enjoy traveling together and plan on visiting family towards the end of the year. If we save now, we’ll be able to take advantage of travel deals as they come available. My husband also has a “splurge fund” that he can put the money into for future gadget purchases. If he continues to deposit his coin jar money, he’ll have a healthy splurge fund in no time. 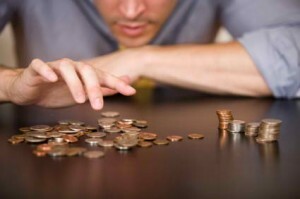 If you have a ton of coins piling up in your house, Coinstar can be a useful option. If you have a specific savings goal in mind, like a purchase at Best Buy, Coinstar will count all your coins and give you a gift card with no service fee. With some retailers, you can even get an additional bonus added to your gift card purchase. Check online to see what the current deals are. If you just want to turn the coins into cash, there’s a fee, with Coinstar taking 9.8 cents per dollar for the service. So if you’re looking at cashing in your coins, you’ll probably want to skip the direct cash conversion. Last but certainly not least, I wanted to mention an option that gives a great return: donating to a charity that matters to you. I just want to highlight one that we care about – the education focused DonorsChoose. As the name implies, you can specifically choose which classroom you want to support. Donating to this cause is something that we enjoy doing because we know where the money is going and how it’s being used to help the students. In fact, we occasionally receive cards from the students. While $100 might not be a huge amount for other charities, it can go quite far at DonorsChoose. Even though it’s probably not your main reason for doing it, if you decide to make a contribution to charity, there are also tax benefits. Just be sure to keep receipts from all of your donations throughout the year. Since I know a lot people like to collect their spare change, I’d love to get some more ideas on how best to use it. How many of you collect your loose change? How do you use it? Have any of you tried Coinstar as an option? and exposure! Keep up the superb works guys I’ve incorporated you guys to our blogroll. I spend my change during my day to day transactions. I’m surprised that you would continue to fill your change cup in your car until it was full. If you’re driving around to the store, grab some change from that cup and spend it in the store. That way you won’t be accumulating more and more change. I save my spare change in a canister I received from operation smile and when full take it to a Coinstar machine and punch in the operation smile code (1982) and the money goes to them. Op smile does some fantastic work to repair the lives of children all over the world. The smallest bill in Europe is 5 Ã¢ï¿½Â¬, about 6 $. So you get a lot of (not so small) change. But as you usually pay cash at least in the small shops, coins are always welcome there and there is no necessity to take them out of your wallet at home. I’m a bartender so it’s easy for me to accumulate change. I roll my own change and deposit into the bank whenever my “boot” gets full. I’ve managed to save almost $250 this year by doing this. Just a quick tip: If you’re looking to trade your coins for cash, TD Bank has a “penny arcade” which does not charge a fee to cash in your change. They offer this service to customers and non-customers alike. The machine spits out a receipt and you need to bring it to the counter, and they will either deposit it into your account if you have one, or give you cash. It works out quite nicely and you don’t need to pay a fee! Our change goes into the kids’ 529 college account. We figure there’s no way we’ll be able to pay for everything, but every penny helps. We opened the account with UPromise (with a Vanguard fund) before they were born (they’re 5 and 7 now). All “found money” goes in there, including rebates and side-business profits. Great post! I’ve been doing this for some time, and it’s amazing how it adds up. I use cash for most daily expenses, so I often have change at the end of the day, which goes right into my change jar. I have a container with a coin counter on top (can be had at Walmart) that counts your change as you deposit it. I’m up to a little over $75, and it didn’t take long. This is a great added bonus each month. Thanks for the good article. Like some of the other posters here I primarily use a debit card. However I usually log in to my bank account once a day or every other day and transfer ‘loose change’ in my checking account to my savings account. Usually I have to transfer at least a whole dollar so I might transfer like a $1.67 or so. One month I acutally put $55 in savings this way and never even cam close to missing it. I put all my spare change into a box for charity – actually my 3 year old does it for me. Whenever he finds any coins, he runs over to deposit them. If I turn my back long enough, he’ll even attempt it with paper money. I second the Amazon gift card option. We’ve used our change jar savings to replace two small kitchen appliances–one each year. That kind of splurge is enough to keep me from giving in to vending machine temptation. My folks used to take their coin collection to the bank once per year and buy either I-bonds or E-bonds for my kids. The oldest just cashed out his bonds and opened his own ING account when he started college. And ptkdude – I think your use of end-of-the-month leftovers is an excellent idea. I am going to adopt your system! I keep all my change in one of those big 5 gallon water jugs. The Wife and I let it collect until we go on vacation or want to buy something big. It lessens the cost or provides an expensive dinner. The TD Bank near my home recently started charging a 6% fee to use their coin counting machines. It used to be free. When my coin-collecting container at home approaches full (or approaches too heavy for me to lift), I take it to the nearby local branch of TD Bank. They have coin-counting machines which are MORE ACCURATE than the “supermarket” machines (I know because I’ve pre-counted), and they don’t take a cut and don’t even require you to be an account holder! I’m sufficiently self-disciplined to put the resultant paper cash in my wallet but then pay an equal amount online to my last remaining-and-reduced-almost-to-zero MasterCard. A fun little game that always helps me to remember that the pennies add up. I don’t use cash all that often but when I do I save my change in a jar on my dresser. Every year around my birthday I take the coin jar to the bank and run it through their coin counting machine and whatever I have I deposit in my bank account. It gets used for multiple things depending on what is most pressing at the time. I’ve applied it towards vacations, debt repayment, or buying myself a nice present for my birthday! I use a piggy bank and every so often I deposit it all into my bank account. Each pay I withdraw $40 a fortnight for my spending money that I can spend how I like. I put the silver coins (5c – 50c) into my piggy bank and I keep the gold coins ($1/$2) in my purse. Just before taxes I’m going to count and deposit my money. All the comments offer excellent ideas. I don’t use cash, as all my bills go on credit cards to maximize cashback rebates. I do pick up coins on the street/sidewalk on occasion. A penny here, a dime there, a quarter once or twice. I put it in a small cup, then add it to my next deposit at the bank. The amount is not much, but keeping coins at home is losing interest. I like to deposit ASAP, however small the amount. Just add to the deposit that you would make anyway. My Chase online savings account pays .10% interest, Ally online savings account pays 1.05% interest, and Rewards Checking Account pays 4.01% interest (up to $25k.) If I keep the coins at home, I get 0% interest. Also, fwiw, I used to let change build up in a big beer mug until I had something like $50, and then I’d roll it and deposit it. Now, I just keep empty my pockets into the cup holder in my car and then I spend it on random stuff like when I want to grab a drink at a gas station. I sort out and use everything that is not pennies. my p[enny jar is a half-gallon glass milk bottle. I would guess it weighs in about 15 lb by now, which would convert to about $27 according to a google search. This jar has been accumulating pennies for about 4-5 years. I’m not much for building up cash without earning something for it. When it’s full, I might just sell the whole jar or give it to a kid that wants to count it all out rather than go through it myself. My change jar doesn’t grow very fast, as I use debit for almost everything. What change I do accumulate goes to Coinstar to get converted to an Amazon gift card to pay for whatever household purchases I need. My “real” change jar is my checking account. The evening before my paycheck gets direct deposited, I go in and check the balance. Anything that’s in there gets split down the middle the following day, with half going into savings and half to pay down debt. This is in addition to the amount I already put into savings and the additional amount I am already paying on debt. I figure I didn’t need it since it was still sitting in there, so I need to put it to good use instead of blowing it on beer. Thanks Nickel for sharing the tip! Money I find I donate to the local animal shelter (minus any valuable ones, I sub. out normal dimes for silver ones, modern pennies for wheat ones etc.). Change I generate: I sort it by type, check for valuable coins, and keep in jars until roughly full. I then take to my bank who sorts it free since I have an account. I deposit it into my annual Christmas vacation fund. I tend to find a small number of silver coins per year (in change mostly), but they are now the harder to spot ones. Mostly the Ã¢ï¿½ï¿½42 nickel, the odd 40% silver Ã‚Â½ dollar, and a few dimes. Most everyone has already mined the quarters out by now. Wheat pennies are common. With that amount, you could start investing using Schwab index mutual funds. Their minimum initial investment is $100.